Following on from gun fit, the next vital thing to get right is a good solid consistent gun mount. 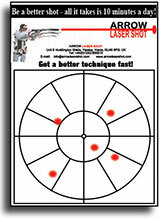 Using ARROW LASERSHOT during practice, each time you fire, the intense red laser will show you exactly where your gun is pointing, this is, not necessarily, where you think it is pointing. The accuracy of ARROW LASERSHOT ensures that when you pick a point of aim & fire, you can see exactly how accurate your shot was, the point of aim can be the corner of a picture, the key in a lock, etc. mount the gun, aim track, fire & follow through. Now dry mounting becomes more realistic and enjoyable, therefore gives you “Quality Practice” and this will be reflected in your increased scoring performance. With your ARROW LASERSHOT in the muzzle of your gun, raise and mount the gun 5 times and fire when as soon as you think the gun is mounted correctly, you will be surprised, without practice, how irregular your Gunmount is, therefore hitting birds, whether wing or clay will be very (forgive the pun)extremely hit and miss. If your hit pattern is as shown on the left, just think how far your aim will be out at 40 yards? With regular practice of only a few minutes a day using ARROW LASERSHOT your Gunmount & Gun Control will improve, you will soon be seeing your hit pattern developing, as shown on the left. 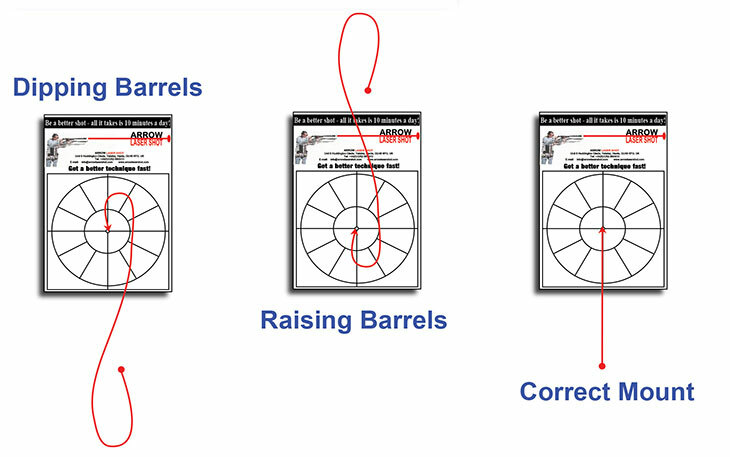 If you perfect this simple test at home your shooting improve, both Wing & Clay Shooters have found that this can add over 10 to 30+ targets to their final score! Very simply you have theNatural ability to point at any item around you, the difficulty some people have is when they pick up a shotgun and try to do the same thing. The hand/eye coordination needs a helping hand and will only take a short while to perfect. Get into a ready position with your feet correctly and comfortably placed, weight slightly over the front foot. Using an ALS Pattern Plate keep your ARROW LASERSHOT switched on all the time, mount the gun from a ready position, as you raise the gun to mount you will see the red laser dot follow the line of your mount. It’s not simple, but with practice you can quickly develop the gun control of a Champion!!! For wing shooters, use exactly the same procedure but starting with your gun at a 40 angle. 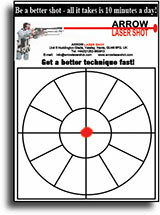 If when mounting you dip or raise your barrels, ARROW LASERSHOT can identify the extent of the problem & help to overcome and cure it, to do this, stand in front of a wall or door,select a point of aim at eye level, keeping your finger on the trigger, therefore fining the laser, mount the gun, you should see the laser light rise evenly and consistently up to the point of aim. If you are dipping or raising your barrels you will see this immediately, regular practice will overcome this problem, resulting in you getting onto the bird quicker with a more consistent gun mount. The example shown on the top left is dipping, the gun starts at about the right point but then dips as the gun is mounted and as the gun is Raised to the full mount, the shooter overcompensates and eventually gets on the point of aim. The example centre, shows a similar problem but for raising barrels, but the start point is too high. The example top left is a perfect mount & the minimum of movement can clearly be seen.